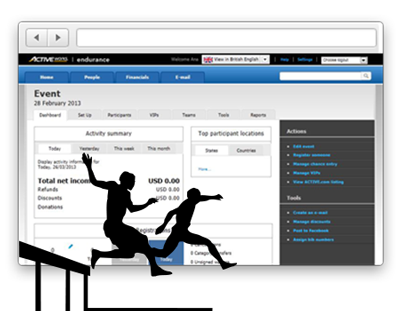 Join the 50,000+ event organisers that use ACTIVE 's registration software to manage and grow their event. 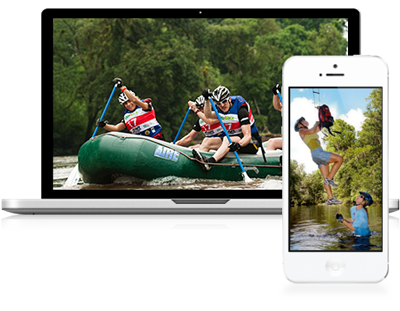 From organising mud runs, obstacle courses, to costumed chases, ACTIVE's Adventure and Obstacle race event software is designed to cater for the most hyper-social team-based events. 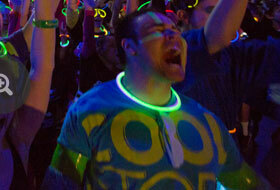 ACTIVE Network can provide you with the unique support you need to plan and organise your event. Take advantage of the hyper-social nature of adventure and obstacle race events by promoting your race to groups of participants via diverse channels, including social media. FREE ACTIVE.com Listing – Increase your race audience by promoting your event on ACTIVE.com which attracts 2.5+ million unique visitors each month. Integrate Social Media Tools – Participants are able to "like" and "share" your event when they register, promoting your event on ACTIVE.com as well as their chosen social media channels such as Facebook or Twitter. Event Page Creator - Impress your race audience with a professional looking event page that is quick and easy to create and manage. No need for the help of outside designers or IT as no HTML knowledge is required! Email Marketing - Drive race registrations by sending automated, targeted emails to your database. You can segment your lists in the system and schedule updates and confirmation emails. 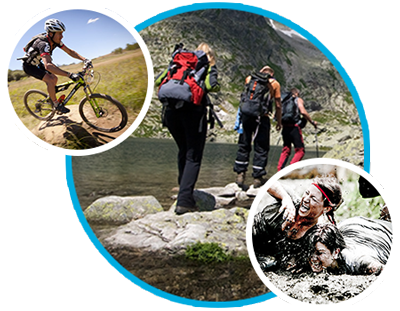 Our marketing resources have proven to help get more participants to register for your adventure events. Easily manage the complex requirements of your event with software that's built to simplify and automate. Online Race Registration & Payments – Register participants and collect payments quickly and efficiently. Collect registrations while on the go through your mobilised admin centre on race days. Team & Group Management – ACTIVE’s race registration software allows you to accept and manage group registrations with ease. Standard & Custom Reporting – Stay ahead of the race by making more informed decisions with reports on registration numbers, participant demographics, revenue streams and more! Fundraising – Raise money and track donations with the fundraising widget. Data Security – ACTIVE’s software is PCI Level 1 compliant so you can rely on our strict standards of data security to keep all your payment and event information safe. Manage every aspect of your race with one easy to access race management system that helps you save time and keep your participants happy. world of Adventure and Obstacle racing. Mobile Event APP – Eliminate time consuming emails and phone calls by allowing participants to edit their registration information and access up-to-date event information on the go from their mobile device. Meet and Exceed Participant Demands – Create wait lists, coupon codes, and early-bird registration discounts. Custom Training Plans – Engage your participants prepared for your race. ACTIVE's technology can help you win the loyalty of your participants by strengthening your brand. Partner with ACTIVE – With 10+ years in the industry and thousands of clients, we are not just another technology provider, we are the leading experts in our field. We can provide you with advice on everything from website optimisation, marketing best practices to pricing strategies. Call or email us at no extra cost. We provide technical support in your local language as well as an online help centre. No matter what your question, our dedicated team of experts are on hand to help you. 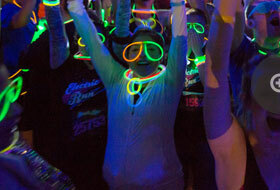 We understand that planning a race can take up a great amount of time and resources. Our race management software is simple to set up, allowing you to start processing registrations quickly and without hassle.